Many full-time working parents are looking to do more cooking and eating together at home. But who has the time? 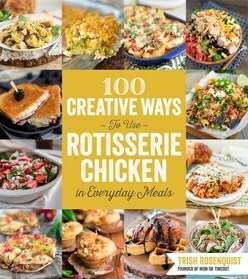 With 100 Creative Ways to Use Rotisserie Chicken in Everyday Meals, readers can cook stress-free meals at home that their families will love using the most popular, versatile and affordable animal protein around: chicken. Trish Rosenquist is the founder of the popular blog Mom On Timeout which has received over 118,000 Facebook likes. With two boys of her own, she knows just how busy life can get when you've got little ones. She has the solution with simple and fast recipes that make meal preparation easy whether that means effortlessly putting together an at-home meal with a rotisserie chicken, walking in the door to a ready-to-eat meal waiting in your slow cooker, or whipping up a tasty meal in just 20 minutes or less. The recipes are broken up into chapters that fit your lifestyle. Save money and time at the grocery store with the chapter on 5 Ingredients Or Less, where you'll find BBQ Chicken Calzones and California Club Grilled Cheese. Short on time and energy? Your go-to chapter is 20-Minute Dinners, with recipes like Pesto Chicken Skillet Casserole and Easy Chicken Fettuccine Alfredo. If you've got chicken, you'll never have to stress over mealtime again. Extremely popular blogger and founder of MomOnTimeout.com beats the stress of cooking on a tight schedule and budget with 80 quick & easy, chicken-based recipes for delicious family meals.